In our previous article, we talked about the latest launch in Livorno of the Benetti yacht FB275, as a final stage of its Giga Season Program. In fact, after the two launches on December 18 and February 5, the 108-meter FB275 brought to an end a busy and productive season, during which the italian company was fully focused on an exceptional endeavour: building 3 yachts over 100 meters in parallel and launching them in the space of just 100 days. This remarkable achievement was made possible by an ambitious business plan involving major financial investments (in infrastructure, organisation, not to mention workers and shipyard safety). 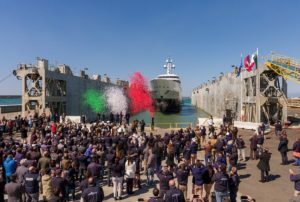 The expansion of Benetti’s Livorno shipyard in particular, with the construction of two latest generation industrial sheds (at a cost of over €18 million), significantly increased the Company’s production capacity. This challenging project has been used by the shipyard to fine tune its production processes still further, guaranteeing the highest standards of quality and reliability in all phases of construction: from design, to engineering and finally delivery. The launch of the three giga yachts is an achievement that upholds to perfection the tradition forged by Benetti brand, in a history of successful challenges built on the insight of the founders, starting from the early ‘900 transition from building cargo ships to focusing on pleasure craft. After the second world war, Benetti began series production of steel explorers, that can be regarded as the first true yachts ever built, becoming the go-to shipyard for crowned heads and successful businessmen. And then there was the Nabila, the largest and most sophisticated yacht of its time, as well as the launch of the Classic line, which for the first time concentrated all the features found on much bigger yachts in just 36 meters. This was followed by the acquisition of the storied Cantiere Orlando to increase production capacity and the construction of the Ambrosia in 2005, the first diesel-electric yacht, which brings us to this last decade and the signing, in a particularly complicated period for the industry, of 4 contracts to build giga yachts, one already delivered and three launched in the space of 100 days, including the world’s biggest hybrid over 5500 GT. This remarkable achievement extends the Azimut|Benetti offering still further and the Group is now the only shipbuilder in Italy, and one of very few worldwide, to offer a product range that spans from the smallest 12-meter Atlantis to yachts over 100 meters long built by Benetti. The breadth of the offering and the complementary nature of the two brands, Benetti and Azimut, represent formidable assets and the owners have no intention of changing this. There could have been no better way for Azimut|Benetti to kick off its 50th anniversary year, a milestone reached by the Group after confirming its position, for the nineteenth time, as the world’s leading builder of mega yachts and reporting brilliant results for fiscal 2017/18 (with value of production standing at €850 million and Adjusted EBITDA at €55 million). This success is confirmed by excellent performance reported by the other Group companies: Fraser Yachts, Lusben, Yachtique and the Marinas, a segment in which construction work is advancing rapidly on the tourist port in Malta. Looking ahead, and specifically at Benetti, for 2018/19 the Company forecasts a 75% year-on-year increase in units under construction (from 12 to 21). In fact, planned production for the coming 12 months, including both the Viareggio and Livorno shipyards, totals 32 yachts from 29 to 100+ meters in length. Of these, a full 17 are planned for delivery in 2018/19. The product range is concurrently being extended, with 3 fiberglass yachts under development and 4 new B.NOW models from 50 to 68 meters also at an advanced stage of design. Production work on the first one will start in May 2018. General increase in Benetti technicians and suppliers’ kow-how that allowed the shipyard to reach a peak in technology levels and accuracy, that only few shipyards in the world can rely on.